Grease is made up of oil, thickener, and additives. Understanding how each component works can help you make the right choices for your needs. Our partners at ExxonMobil want you to understand the various types of grease, and how to select the right grease for the right application. Also identified are common sources of complexity in a grease program and the impact it can have on the reliability and life of your equipment. Click the image below for the complete Grease Lubrication document. 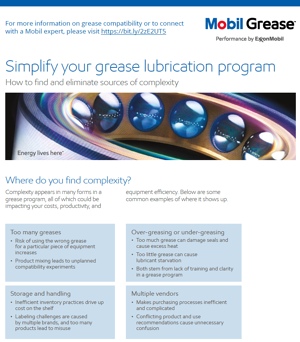 For more information on grease compatibility and to connect with a Mobil expert, please visit the Mobil Grease Compatability site.